We got a small but sustained boost in traffic from revising how we approach social media. Over the past decade, we’ve gotten considerable traffic and branding visibility through social media. After all, we’ve been on Twitter since 2007 — that’s 11 years! We rebranded our @smallbiztrends Twitter account from a combined personal/organizational account to a company account. I started using my individual account (@anitacampbell). Our social media manager has increased engagement 150% through several strategies, including sharing humorous content. We improved our LinkedIn presence, publishing more content there. We upped our presence on Pinterest, YouTube and Quora. And we cut back on Google+, in light of Google’s plan to shutter the network in 2019. Conclusion: Social media is evolving. Every small business should periodically re-examine what it is doing and where. We refined our internal content production processes, achieving 25% improvement. In the publishing business, content is our product (not just a marketing technique). Efficiency, quality and quantity all matter. Processes and systems can make or break profitability. Our executive editor did a fabulous job guiding the team toward evergreen content that leverages our content investment wisely. Our assistant editor did a magnificent job coming in 10% under budget for content expenses. He manages a global team of talented writers. Our search specialist does wonders on on-page optimization. Our editorial assistant does a great job filtering news to keep our publishing schedule moving. Our client administrator worked with the Content team to ensure 96% on-time delivery of sponsored content deliverables. The team collaborates virtually. We are proud of being able to operate as if we are in the same room — even though we are across the globe. We use various chat tools and shared documents to achieve this. Occasionally we even hold our Tuesday executive team meetings by video. Note the screen capture image at the top of this report showing a recent meeting. We estimate we got 25% process improvement overall. Conclusion: Process improvement opportunities in a small business are often small things staring you in the face. Improving one small thing may not move the needle. But add up several changes and the difference becomes meaningful. Like any small business, we face challenges every day. In 2018, team Small Business Trends had three large challenges to overcome. As I mentioned at the start of this piece, our first quarter of 2018 started in the red. Why? Seasonality. Revenues in our industry are seasonal, just like many of your businesses. Our business model is based primarily on ad earnings. We are able to provide content free to you because we earn from advertisers and sponsors. Advertiser spending is traditionally lower in the first quarter. And for unexpected reasons, we ended the prior year with smaller-than-normal cash reserves. I was honest with the executive team. I explained what we were facing. There’s no point in hiding the situation. If you do, you can’t get your team’s help to turn things around. I’m happy to report that team Small Business Trends rose to the challenge. We not only managed to get through the first quarter, but we had an amazing turnaround in eight months. Two factors contributed. First, we forged a strong partnership with the right ad revenue partner. This gave us a recurring revenue stream. We have multiple revenue streams, but most have huge swings from month to month. Having one revenue stream that’s more predictable made all the difference. Second, ad rates for the final three quarters of 2018 were on fire. 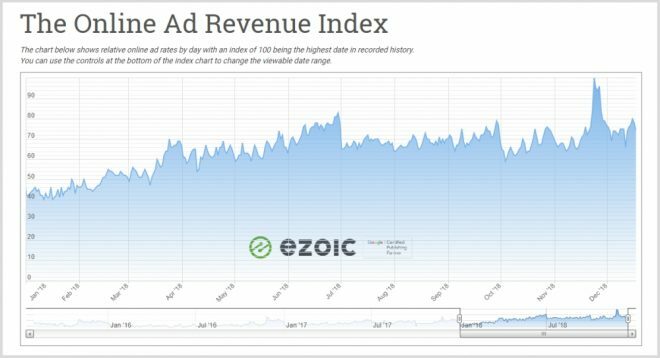 The Ad Revenue Index image above below rates for the entire industry during 2018. Rates nearly doubled between January and December, as you can see from the image below. That helped too. Conclusion: Find at least one predictable revenue stream. It alleviates some of the white knuckle pressure to meet payroll. You will be freed up to work ON your business, not just IN your business. Imagine for a moment that you were so busy, you didn’t have time to keep your store shelves and warehouse organized. You didn’t have time to clean the premises. Fifteen years go by. Just think what your business would look like! That’s what we were facing. Think of this website (smallbiztrends.com) as our storefront and warehouse. Outdated content piled up like virtual dust bunnies. Technical issues negatively affected Google crawling. To top it off, we came face to face with the 80/20 rule. Big data analytics showed that 80% of our ad revenue is driven by about 20% of our content. This is caused by two factors. First, some older content is simply outdated. Second, the more content you have, the deeper the best content gets buried. We knew we had to take a step back in order to grow in 2019. We started by conducting a site audit using a tool called SEMRush. The great thing is that the tool gives a roadmap for how to fix the issues, and we’ve made good progress already. Conclusion: Don’t put off maintenance. Time is not your friend. Site speed is more important than ever, especially with the shift toward mobile visitors. So we set a goal to improve site speed during 2018. And I am happy to report the site is much faster today than before we started. One of the changes that dramatically improved site speed for us was caching pages on a CDN. Previously it would take a few extra seconds or partial seconds to create the page dynamically. Caching really helped. But improving speed is not a “once and done” task. Many factors slow a site down. In fact, speed varies page by page. And new issues pop up. We have to continually tweak. Conclusion: With some challenges the bar is always moving. Keep at it. So there you have our 2018 Annual Report from Small Business Trends. We accomplished some things we are proud of. And we managed to overcome some gnarly problems. Organize the site more. We will continue weeding out older, less relevant content. We will focus more on structure. Improve user experience. We intend to focus on improving the mobile experience for you, in particular. We’ve already started. For example, we recently widened our mobile template by a number of pixels. When we implemented our responsive template five years ago, mobile screens were narrower. Screens have trended larger since then. In addition, our COO has undertaken UX improvement as a special project of hers. Focus on branding. We will strive to increase brand recognition. Knowing we have so many loyal readers encourages us to do more to stay top of mind. Continue building team strength. One thing we’ve learned over 15 years is that a small business’s strength is its team. When our team members put our collective heads down, we accomplish amazing things So we are investing in training and expanding the knowledge of the team. We can’t wait to see what 2019 brings! We at team Small Business Trends hope this Annual Report inspires you to reflect back on YOUR success. After all, that’s our mission. “Small business success … delivered daily” means we strive to help you be successful, everyday. Anita Campbell, Founder and CEO of Small Business Trends. PS: What are you proudest of from 2018? What do you plan to focus on in 2019?